Continuos Integration (CI): This is a valuable practices on its own - making sure code builds and new code doesn’t break anything that already exists. 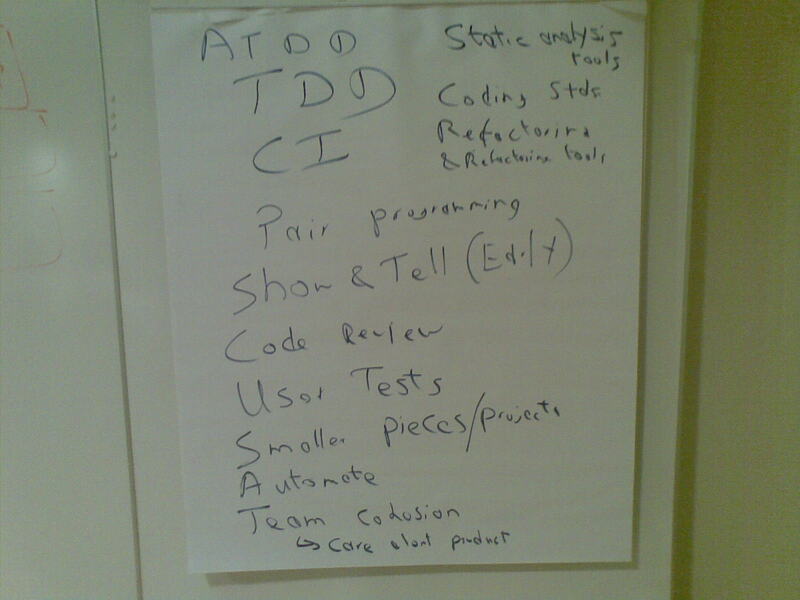 When coupled with TDD and ATDD to created automated, repeatable, test suites, it is an order of magnitude more valuable. Pair Programming: The controversy over pair programming seems to have died down, but then so too have examples of people actually doing it. A shame really. It is instant code review, it is two-heads better than one (think of commercial pilots or surgical teams). It also allows developers to focus intensely on the work in hand - few distractions from telephone calls, e-mails, SMS, and all the other rubbish that distracts us so easily. Code review: The next best thing to pair programming. If people won’t pair then at least code review. Put in place a light weight process which happens as soon after the code is written as possible. The big formal process so many of us learnt about in school aren’t practical - only NASA can really afford them anyway. Instead use a lightweight process, you will get 80% of the benefit for 20% of the cost. Start by having a group discussion - face-to-face, not over e-mail or on a mailing list - about what could be in a coding standard. Find the areas of agreement and have three or four categories: a very few items as “mandatory”, more items as “recommended” and more as “candidates.” This third group are possible candidates for inclusion in recommended or mandatory but need some consideration. The fourth group for things you agree not to standardise on.